Vertamae Smart-Grosvenor was from lowland South Carolina and a native speaker of Gullah Geechee, a form of creole English. David Claessen / Courtesy of Julie Dash and "Travel Notes of a Geechee Girl"
Writer, actor and longtime NPR contributor Vertamae Smart-Grosvenor died Saturday at age 79. "Four years since I've been on 'Fuskie. From what I hear, this may be the last time I'll see 'Fuskie as I know it. A money man from upcountry has bought 1/3 of the island. They say he plans to build houses and condos for the rich. Daufuskie will change, and I know everything must change, but like the islanders, I wonder what it will mean." NPR producer Art Silverman worked with Smart-Grosvenor on that 22-minute story. "She just conversed with people and reacted to them, and my job was not to step on it," he says. Silverman had only just met Smart-Grosvenor and had to look Daufuskie Island up on a map. He remembers arriving on the ferry and being greeted by islanders cooking seafood on the beach. They were descendants of West African slaves and they spoke Gullah Geechee, a form of creole English. Smart-Grosvenor was from lowland South Carolina, but Gullah Geechee was a mother tongue for her, too. Emory Campbell is a board member at the Penn Center, which is devoted to Gullah Geechee culture. He says Smart-Grosvenor was the first person he met who openly called herself a "Geechee." "That was a pejorative term that we didn't use very much," he says, "but Verta had embraced it for some time and had, you know, written about it. And so we immediately hit [it off] because she liked to talk about rice, and that's something that we always ate and I never knew why." Smart-Grosvenor told him why: Rice was a staple crop on colonial plantations, as it had been in Sierra Leone and other West African countries where people were enslaved. Smart-Grosvenor cooked rice countless ways for a circle of friends that included down-home folk and the famous (David Bowie, James Baldwin). She was a self-described culinary griot. Her book Vibration Cooking is a memoir told through scores of low country recipes. "Vibration Cooking certainly does not adhere to any rules," says Marie Brown, Smart-Grosvenor's editor at Doubleday. "And I think that what makes it really interesting and a cult classic is Vertamae's gift as a storyteller." Smart-Grosvenor's imagination fueled her life and travels. When she was 19 in the 1950s — weary of being a gawky, tall, black teenager — she saved money from a department store job to sail to Paris, a trip inspired by Josephine Baker. "There I was: in Europe; in Paris, France, the City of Light," she wrote in a 1986 commentary. "As I walked down the Boulevard Saint-Germain, I thought, 'I can't paint; I can't write; and I can't sing and dance like La Baker — but something great and wonderful is gonna happen to me.' The myth of Europe made me believe in the possibilities. I was one of the thousands of Afro-Americans in Europe seeking a future." Smart-Grosvenor met her husband in Paris and made friendships there that lasted a lifetime. By the 1970s she was back in New York, and had become a legend in Bohemian circles. Actor Bob Wisdom remembers people telling him he had to meet her, and one time, at a jazz club, he did. "All of a sudden, there was like literally a whoosh that came into the club and Verta was there with, you know, a gaggle of friends," Wisdom remembers. "And there was a bunch of laughter, and I see this tall, striking, fine black woman standing at the doorway with this big smile. And everybody stopped and their heads turned away from the bandstand, looking at Verta. And she knew everybody in the club." Later, they went to a fabulous Upper West Side apartment where Smart-Grosvenor had been cooking. "The place is like laid out with dishes of every kind," Wisdom says. "And Verta had spent the day cooking. And I was like this little young cub — you know, I guess I'm a junior year in college — and I'm hanging out with Amiri Baraka and there's, you know, Sonia Sanchez and there's Nikki Giovanni ... every writer and painter and, you know, critic. They were all there — the black literati was there — and Verta was holding court." She fed them — their bellies and their souls – just as her commentaries fed NPR listeners. Smart-Grosvenor spent the last years of her life in the place she loved best — South Carolina. We are very sorry to report a death in the NPR family now. 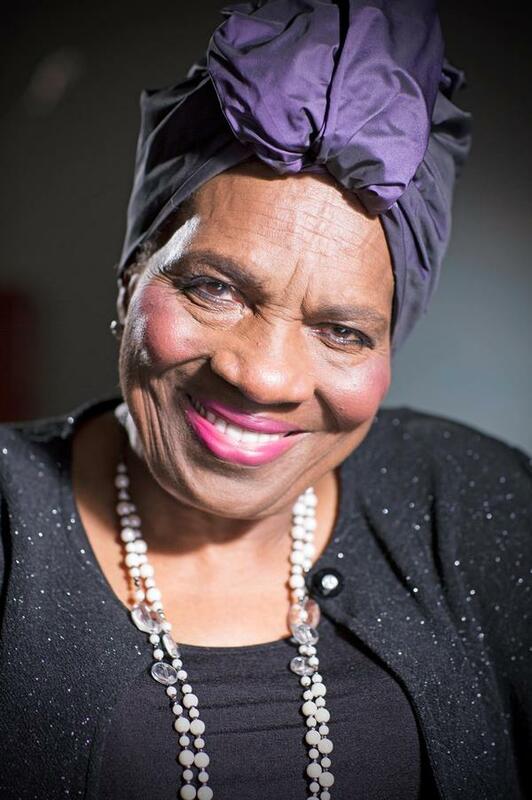 Longtime NPR contributor Vertamae Smart-Grosvenor has died at 79. Vertamae, as everybody called her, contributed more than 300 commentaries to NPR and was known for her wide-ranging travels and culinary explorations. Jacki Lyden has this remembrance. JACKI LYDEN, BYLINE: For many of us, this was the defining Vertamae-Grosvenor piece, a 1983 visit to a place she loved, Gullah-speaking Daufuskie Island. VERTAMAE SMART-GROSVENOR, BYLINE: Long before day clean, as Gullahs call the dawn, our ferry chugs across Calabogie sound. The water is wide, and it's been too long - four years since I've been on Fuskie. From what I hear, this may be the last time I'll see Fuskie as I know it. A money man from up country has bought one-third of the island. They say he plans to build houses and condos for the rich. Daufuskie will change, and I know everything must change. But, like the islanders, I wonder what it will mean. ART SILVERMAN, BYLINE: I was at her disposal to make recordings and basically just rolled on these amazing things. LYDEN: Art Silverman was the producer lucky enough to be assigned to produce that 22-minute story with Vertamae. SILVERMAN: She just conversed with people and reacted to them, and my job was not to step on it. LYDEN: He'd only just met her and had to look Daufuskie up on a map. When they arrived, he said he saw islanders cooking seafood, waiting for them on the beach. BERTHA ROBINSON STAFFORD: (Speaking Gullah Geechee). LYDEN: They were descendants of West African slaves speaking Gullah Geechee, a form of Creole English. SMART-GROSVENOR: I grew up in the Carolina lowlands, so I understand Bertha Robinson Stafford (ph). She's right. I think it's terrible they stole her turkeys like that. EMORY CAMPBELL: Verta was the first person I heard openly admitted that she was a Geechee. LYDEN: Emory Campbell directed the Penn Center, which is devoted to Gullah-Geechee culture. He met Vertamae on that trip. She was from lowland South Carolina, but Gullah Geechee was a mother tongue for her and such speakers were also, as she called herself Geechee. CAMPBELL: That was a pejorative term that we didn't use very much, but Verta had embraced it for some time and had, you know, written about it, and so we immediately hit because she liked to talk about rice and that's something that we always ate. And I never knew why. LYDEN: She told him why. Rice was a staple crop on the colonial plantations, as it had been in Sierra Leone and other West African countries where people were enslaved. She cooked rice countless ways for friends that included down-home folk and the famous - from David Bowie to her pal James Jimmy Baldwin. Vertamae was a self-described culinary griot. She wrote the book "Vibration Cooking" which is really more of a memoir told through scores of low-country recipes. Her imagination fueled her life and travels. When she was 19 in the 1950s weary of being a gawky, tall, black teenager, she saved money from a department store job to sail to Paris inspired by Josephine Baker. SMART-GROSVENOR: There I was in Europe, in Paris, France, the city of light. As I walked down the Boulevard Saint-Germain, I thought I can't paint. I can't write, and I can't sing and dance like La Baker, but something great and wonderful is going to happen to me. The myth of Europe made me believe in the possibilities. SMART-GROSVENOR: I understood your biggest theme song "J'ai Deux Amours." JOSEPHINE BAKER: (Singing in French). LYDEN: Grosvenor would meet her husband in Paris, the father of her daughters. But beyond that, she also met friends she kept for a lifetime. By the time she returned to New York after some years, she was a legend in Bohemian circles. In the '70s in New York, actor Bob Wisdom said everyone told him you have to meet Vertamae. One night at a jazz club, he did. BOB WISDOM: We walked in. We were at McCal's (ph), and all of a sudden there was like literally a whoosh that came into the club. And Verta was there with, you know, a gaggle of friends, and I see this tall, striking, fine, black woman stand in the doorway with his big smile. And everybody stopped and their head turned away from the bandstand, looking at Verta. And she knew everybody in the club. LYDEN: Later, they went up to a fabulous upper West Side apartment where Vertamae had been cooking. WISDOM: The place is, like, laid out with, like, dishes of every kind. And Verta had spent the day cooking, and I was like this little, young cub, and I'm hanging out with Amiri Baraka. And there's, you know, Sonia Sanchez, and there's Nikki Giovanni and this one - and every writer and painter and, you know, critic they were all there. The black literati was there, and Verta was holding court, you know left - and I just kind of watched her. LYDEN: She fed them. She fed their bellies and their souls. And this was the kind of tour de force she brought to those hundreds of commentaries for NPR, where she fed all of us. LYDEN: In the last years of her life, Vertamae Smart-Grosvenor was able to live in the place she loved best, South Carolina. She's survived by her two daughters and grandchildren and many friends at NPR. For NPR News, I'm Jacki Lyden. Transcript provided by NPR, Copyright NPR.